Hereby, the negative team group member first speaker is Christine, and the following order is Marvin, Joris and Song. In this Blog you could have an overview of our group’s debate finding. First of all, Christine was put forward the introduction of the topic. It exists on paper to support the smallest income-generating activities. It should have been the tool to make entrepreneurial spirit in developing countries possible as the inability to obtain the required capital to put ideas to work was seen as the obstacle. Strongly associated with the word „micro finance“ is the name „Mohammad Yunus“ who won the Nobel Peace Prize for his contribution to micro finance loans in 2006. The model has many critics and two of the strongest ones, Bateman &Chang, published a study in 2009, which basically said that micro finance keeps people in a poverty trap. This model is a world of make-believe and micro finance is seen by Bateman as one of the most damaging interventions of recent times. Mr. Yunus himself admit in 2011. We’ve sobered to the fact that we’re not going to “put poverty in a museum” through micro finance…. We found that there is a problem with the creating of inequality and discrimination towards men. Mr. Yunus answered on the question why 94 % of his loans go to women that “Women have plans for themselves, for their children, about their home, the meals. They have a Vision. A man wants to enjoy himself.” Sure, Women are in many respects less able to take part in commercial life, but the solution against discrimination cannot be to build up discrimination the other way round. In my humble opinion, Mr. Yunus does here so and that is not OK. While based on our team member’s experience of volunteer-work for a very small micro finance institute myself, I had the chance to witness one of the problems these institutes have, which is that the money keeps disappearing. They usually have to send more funds to maintain the local bank. These banks are not self-financing which is another problem mentioned by Bateman and Chang. To support that, we were figure out some scenarios. The first one is that if Micro finance would not successful: One has to deal with their debts as well which decreases the likelihood of succeeding. Furthermore, if a member of the team gets ill or has other reasons to not participate in the group, all members are being blacklisted. Corruption and abuse might be other risks for them as well. In addition, considering about priority of Investors is getting Money instead of Supporting Development. We could not ignore the fact that Micro finance has high interest rates and strict policies limit success of entrepreneurs. This would be lead to a vicious circle which means loan are being taken to pay off the existing debt. In order to repay a micro loan taken out for a failed micro-business venture, many individuals are forced to deplete family savings, divert remittance flows, and finally sell off family land and other household assets. A failed micro enterprise thus often leaves a very large number of individuals in deeper poverty and insecurity than before. The poor increasingly choose to access micro credit simply to underpin needed consumption spending. This may avert a household crisis in the short term, but the long-term consequences of this strategy are quite frightening. 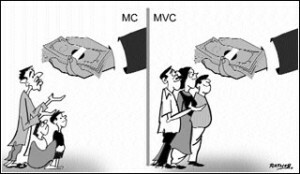 The crisis of Micro finance in India, 2010. In the Indian state of Andhra Pradesh more than 50 farmers bullied, harassed and beaten into making repayments they could never meet committed suicide. The government moved to outlaw micro-lending. In Nigeria scores of micro-lenders collapsed after offering – in some cases forcing – loans upon people who could never hope to repay them. In Mexico publicly listed lenders charged extortionate rates, in the case of one company up to 125 per cent.Many turned on the industry, and some of the sharpest criticism has come from Dr Yunus’s home country. The Bangladeshi Prime Minister, Sheikh Hasina, in a pointed barb at Dr Yunus, condemned the industry, describing micro-lenders as ”blood suckers of the poor”. The poor increasingly choose to access micro credit simply to underpin needed consumption spending. This may avert a household crisis in the short term, but the long-term consequences of this strategy are quite frightening.In conclude, Micro-finance, said the truth of micro-credit was more nuanced than simply good or bad.It was neither the panacea for all the world’s poverty, as its boosters claim, nor the rapacious exploiter of the poor, as its detractors allege. In addition, as Professor Mahmud said, Micro-credit could be a powerful tool to help the world’s poorest, but the introduction of players whose sole motivation was profit had corrupted and distorted the industry.